In search of Homer’s influence throughout the ages, I have been researching a Medieval fresco in the town of Sienna, Italy. Hoping for a relationship between these frescoes and the Shield of Achilles, I found myself, instead, on the Mycenaean trail of Jason and his all-star band of Argonauts. Although this seemed like a curious case of wrong space and warped timeframe, nevertheless I snooped into Medieval Italy, doggedly following in the footsteps of Telamon, the father of Telamonian Ajax, or Aias, as the heroic son of Telamon is known in Homer’s Iliad. As covered in the last post, “Tragedy, Katharsis, and the Theater of War,” Ajax preferred suicide over returning home from Troy without the highest prize of honor. Recalling the glories that accompanied his father, Telamon, upon returning home from his heroic exploits as an Argonaut, the loss of Achilles’ immortal shield to Odysseus was an unbearable shame for Ajax. Following in the footsteps of his father even unto the towering walls of Troy, Telamon was a tough act for Ajax to follow. In the emotional torment of his bedeviled mind, Ajax considered it was better to die by his own hand than to return home empty-handed to his father. Burying the hilt of his sword in the sand, Ajax impaled himself upon his sharp blade and released his war-torn soul to Hades. Telamon really WAS a tough act to follow. An Argonaut serving with Jason in search of the Golden Fleece, Telamon set sail together with such heroic warriors as his own brother Peleus, the father of Achilles; Heracles, the father of Tlepolemus; Menoetius, the father of Patroklos; Laertes, the father of Odysseus; Tydeus, the father of Diomedes; Iphiclus, the father of Protesilaus; Poeas, the father of Philoctetes; Nestor, the father of Antilochus and Thrasymedes; and Theseus, the father of Acamas and Demophon, to name only a few of the heroic Argonaut fathers whose famous sons live on to reap glory in Homer’s Iliad. Early in their young lives, Telamon and Peleus flee their father’s kingdom on the island of Aegina after killing their half-brother Phocus. Arriving in Salamis, King Cychreus gives his daughter, and later his entire kingdom, to Telamon. Cychreus’ daughter, Periboea, gives birth to Ajax. Somewhere in the same timeframe as joining the Argonauts, Telamon teams up with Heracles in a spectacular side-expedition to sack pre-Homeric Troy. They overthrow the old king, install Priam on the throne, and Telamon takes Priam’s daughter Hesione for a war-prize, who later gives birth to Ajax’s half-brother Teucer. [4.56.4] And the writers even offer proofs of these things, pointing out that the Celts who dwell along the ocean venerate the Dioscori above any of the gods, since they have a tradition handed down from ancient times that these gods appeared among them coming from the ocean. Moreover, the country which skirts the ocean bears, they say, not a few names which are derived from the Argonauts and the Dioscori [Castor and Pollux, the brothers of Helen]. [4.56.5] And likewise the continent this side of Gadeira contains visible tokens of the return voyage of the Argonauts. So, for example, as they sailed about the Tyrrhenian Sea, when they put in at an island called Aethaleia125 they named its harbour, which is the fairest of any in those regions, Argoön126 after their ship, and such has remained its name to this day. Exploring the links between Homer, Telamon, and Etruria, we arrive at the city of Siena in the pre-Rennaissance days of 14th century Italy. Painted on the walls of Siena’s Palazzo Pubblico (Town Hall) in 1338-39 are a series of grand frescoes known as “The Allegory of Good and Bad Government” by Ambrogio Lorenzetti. Although there is room for doubt regarding the influence of Homer on Ambrogio’s paintings, there are nevertheless strong similarities between the two cities of Ambrogio and Homer’s description of the Shield of Achilles on which is depicted two cities — one at peace, and one at war. One of Ambrogio’s panels, representing good government, shows a city at peace. The people are depicted dancing, celebrating weddings, and clearly enjoying life. Panel 1 of 3, “Effects of Good Government in the City” by Ambrogio Lorenzetti ca. 1338-39 CE. The opposing panel in the Palazzo Pubblico represents a bad government. The city is ruled by an allegorical demon labeled ‘tyrant’ and the effects of a city badly governed is depicted with soldiers in the street, fields laid to waste, and buildings on fire. Panel 2 of 3, “The Effect of Bad Government on the City” by Ambrogio Lorenzetti ca. 1338-39 CE. The proximity of the horror to the everyday (thus to the workmen’s equally lesser bliss on the opposite wall) is a reminder of the fact that the future is being negotiated and decided here and now, by both private citizens and their government. Instead of the juxtaposition of Heaven and Hell, we deal here with a more subtle and varied system of extensions from the everyday to the cosmic, and ultimately to the eschatological as well. In this way, the fresco feeds the synoptic inclination of human imagination, yet it also brings its centrifugal direction under control. There is much to say here about the nature of this delicate enterprise and its long pedigree in both ancient painting and its ecphrastic (that is linguistic) counterpart. There is little doubt that many exemplary descriptions tend to embrace a spatial and temporal whole that becomes accessible to human perception only through its reduction and projection into a (relatively) small scale artefact. Starting with the most influential ecphrasis, one of the Shield of Achilles in Iliad Book 18, this tendency is typical of pagan (often notional) descriptions of artworks and of the way they indicate the latter’s moral lesson. Despite all the caveats that would be necessary in a full exposition of this vast subject, it is obvious that Christian authors did not hesitate to appropriate ecphrastic devices in order to capture the meaning of Creation as a supreme and unique artwork. 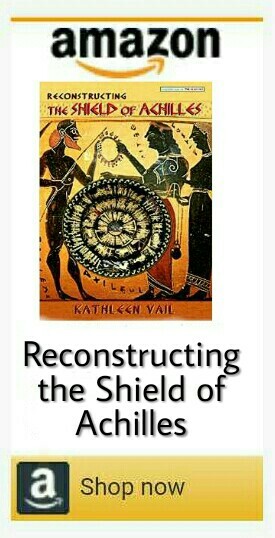 [40:] It is noteworthy that, despite the lack of any historical filiation, there is an amazing structural homology between Ambrogio’s frescoes and the organization and content of the Shield of Achilles. At politically crucial moments, both present us with the tales of two cities and of how the peace is being negotiated within a cosmic framework. By ‘notional’ ecphrasis I mean the constitution of artworks through the very act of description. See J. Hollander, Gazer’s Spirit: Poems Speaking to Silent Works of Art (Chicago, 1995). Feeling a bit of Ajax’s grief over returning empty-handed, I note the irony in discovering a trace of Telamon, instead. Despite the lack of a specific link between Ambrogio’s frescoes and Homer’s Shield of Achilles, there is a remarkable reference to Jason and the Argonauts specifically inscribed on Ambrogio’s 14th-century fresco. Because Ambrogio’s city is not likewise labeled, his reference to the harbor of Telamon in the Town Hall frescoes of Siena is somewhat peculiar. However, according to the History of Talamone, Italy, Talamone was only recently added to Siena’s holdings prior to Ambrogio’s 1338 Commission for the new Town Hall’s frescoes. Intending to build its own maritime and commercial outlet on the Tyrrhenian coast, Talamone was purchased by the city of Siena in 1303, coinciding with the construction of Siena’s new Town Hall, between 1297-1308. Recognizing a footprint of Telamon in Siena’s Town Hall frescoes, it appears reasonably justified to link Ambrogio’s allegorical city with, if not specifically Homer’s shield of Achilles as I was hoping, then, at the very least, with ancient Greek mythology, especially Jason and the Argonauts’ journey home through Italy. Backtracking in time, it is noteworthy that local excavations unearthing Telamon Harbor’s first settlements are dated from the Middle to Late Bronze Age (10th to 11th-century BCE). Reinforcing Diodorus Siculus’ account, this is not an unlikely timeframe for a seminal visit by the hero Telamon and his fellow Argonauts on their legendary journey home. By the 6th century BCE, Etruscan artisan factories begin appearing in Telamon. Fascination with both the local founding legend and the legendary Argonauts is clearly evident in Etruscan red-figure vase paintings, such as the so-called “Argonauts Krater,” ca. 5th century BCE, found at Chiusi (Tuscany, Italy). Etruscan Red-Figure “Argonauts” Krater, ca. 5th Century BCE. The Latin love of all things ancient Greek hardly requires mentioning. Still, an argument for Ambrogio’s possible reference to ancient Greek sources is strongly backed up by his specific labeling of Telamon Harbor in his fresco. Functioning as a founding myth for numerous settlements throughout Europe, the exploits of Jason and the Argonauts remain timelessly beloved throughout the ages. In retrospect, Ajax needn’t have been so morose over following in his father’s footsteps. Generously sharing their glorious kleos with the heroic sons of Homer’s Iliad and Odyssey, this roving band of heroic forefathers left fertile footprints in the virgin forests of Western Civilization. —A respectful shoutout and special note of thanks to SententiaeAntiquae for triggering my research on this topic after I read a very interesting post from 2015, “The Allegory of Good and Bad Government (Palazzo Pubblico, Siena) and Achilles’ Shield” on their terrific blog. Please take a look, I highly recommend it!